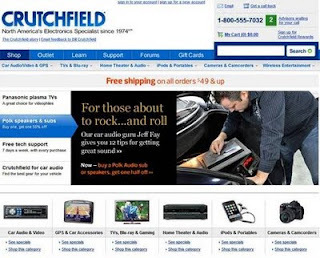 Last week's "Crutchfield: An Attribution Nightmare" was one of the three most popular posts of 2011, and for good reason. The text of the post outlines a shopping experience where attribution becomes challenging, even overwhelming. I received a lot of feedback, via comments, via email messages, and via Twitter. You don't get to view a full picture of reader feedback. I do. So it's time to share some of the feedback, and my reaction, don't you think? Question: Kevin, you clearly doubted your purchase, or you would not have waited a month to place your order. Nobody waits a month to buy an item without advertising playing a major role in the purchase. Kevin: Oh boy. In the article, and multiple times in the comments, I noted that the only reason the purchase was delayed was to make sure that delivery would coincide with a window in which my builder could install the television. It's that simple. If you choose to not believe me, well, then that's your choice. I'm being 100% honest. Question: Kevin, marketers who think customers will find you without advertising will lose market share. Focus on last click attribution or fractional attribution, ok? Kevin: Oh boy. Have you ever conducted a test? Hold out catalogs for three months, and hold out e-mail campaigns for three months. Do sales decrease by 99%? No. Anybody who has analyzed a mail/holdout test knows that customers will find you without advertising --- and the stronger your brand is, the more likely the customer is to find you without advertising. We're attribution professionals, and yet, we fail to execute Attribution 101 --- simple mail/holdout tests. If your attribution professional fails to recommend mail/holdout tests as the cornerstone of a proper attribution algorithm, go find yourself a new attribution professional. Question: Kevin, marketing clearly played a role here, you said so yourself when you decided to search for a lower price. Kevin: I purposely placed this comment in here, because quite honestly, this is the only place where one can logically suggest that price comparisons played a role. If I had found the item for $350 less with comparable shipping, sure, I may have made a different decision. Why almost nobody talked about this is beyond me. This is the essential piece of the attribution solution! I literally told you that nothing influenced my decision, I literally told you that I did execute a search, and yet, the feedback focused on how to parse shopping cart abandonment emails into the attribution routine, or how to parse the gift with purchase into the attribution routine. Question: Kevin, if activities correlate with an outcome, it's probably a good idea to participate in the activity that causes a correlation, right? So if a shopping cart abandonment email is highly correlated with a purchase, we should execute shopping cart abandonment emails, right? Kevin: Let's view this from a different angle. Let's say that you send two email campaigns per week. By doing this, all purchases are correlated with the activity of sending email campaigns to a customer. Therefore, all purchases should be allocated to email marketing campaigns, right? You'd never agree to this if you were a search marketer, a television advertiser, a catalog marketer, or if you had retail stores and you saw that email campaigns took credit for all store purchases. Question: How did you know that Crutchfield offered free shipping? Kevin: I've been a customer since the 1990s, and I recall purchasing speakers in 2008. So, obviously, there is some brand loyalty, prior e-commerce activity, and decades-old catalog activity that fueled my knowledge of the brand, coupled with email campaigns over the past three years. That being said, you don't allocate today's sale to email campaigns mailed three years ago, do you? I'm not saying I have any answers, other than to execute some mail/holdout tests, and to not discount the impact of search in the purchase process. I am saying, however, that we, as attribution experts, have clear biases that result in us giving disproportionate credit to the marketing channels that we align with. And that's the important thing to take away here ... execute some tests, minimize biases, and always remember that a significant portion of purchases (in spite of what some say) happen because of brand loyalty, and not because of marketing activities. Hi Kevin! As ever, thanks for the inspiration - your posts on attribution led me to think a bit on the flawed promise of revenue cycle management by providers of marketing automation platforms. FWIW, if you'd like to wander by and see how your thoughts sparked mine, here's a link - and thanks again for stirring things up! Nice writeup of your thoughts, Lori!